The AK-47 is an automatic rifle in CS:GO that can only be bought on the terrorist side. It is the bread and butter weapon of the buy rounds the terrorists would have, offering good penetration as well as one hit kills to the head, regardless of armour at any range. The AK was designed in 1948 by Mikhail Kalashnikov, and for nearly 80 years has been a staple rifle for the soviet army because of their great reliability in harsh conditions, low production costs and ease of use. Over 75 million AK’s have been manufactured in real life, making it one of the most popular weapons to be used worldwide. 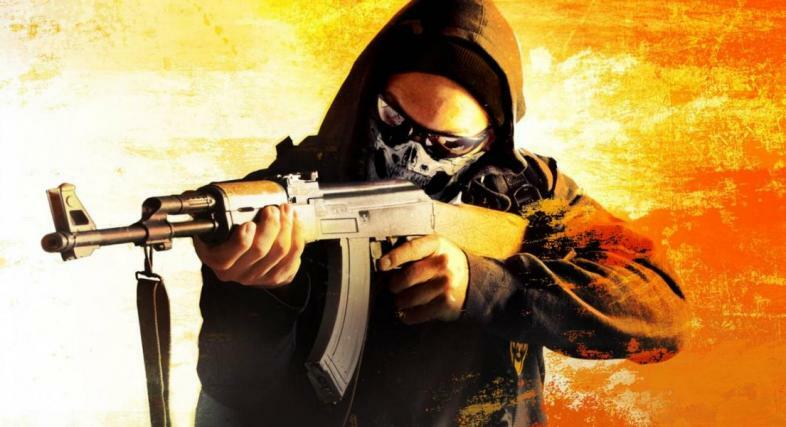 In CS:GO the AK is a cheap, powerful weapon. Providing the terrorists with arguably the best weapon in the game. For only $2700 you will get a weapon that is generally a 3-4 hit kill to the chest and a one hit kill to the head at any distance and with 30 bullets to play around with per magazine, it is an efficient killing machine. Combining the Terrorists’s prevalent economic advantage this cheap weapon also provides $300 per kill, allowing the terrorists economy to spiral into great shape early on. Despite these positives the AK had poor accuracy at longer range, where you can expect hitting pinpoint headshots to be a 50/50 at longer ranges. On top of this the actual spray pattern is hard to manage aswell swinging up and to the right very quickly. Until recently the M4A4 would not be in this spot, but rather it’s sister weapon the M4A1-S. The weapon is a variant of the M4 carbine, which is a weapon produced in the united states and began manufacturing in 1994. The M4A4 shoots 5.56mm bullets and has 30 bullets per magazine. In CS:GO the weapon is the strongest CT weapon in the game, providing a 4 hit kill at most ranges and a two hit kill to the head, unlike the AK. It can penetrate most cover that the AK can, however taking a significant damage reduction in the process. On top of this, the weapon costs $3100, which is $400 more expensive than the AK, which can make the difference in economy battles & buy rounds. The M4A4 is statistically a worse version of the AK, however it does provide better recoil and better long-range accuracy. This makes it a good weapon for the Counter Terrorists, who have the map advantage by default in most cases. The beloved AWP or Magnum Sniper Rifle is a British bolt action sniper rifle which has been in-service since 1996 and is produced by Accuracy International. In CS:GO the AWP is depicted as a high power, high cost, high risk weapon. Providing a one hit kill to anywhere from the groin upwards, however at a hefty cost of $4700. The weapon has also recently been changed to impede movement speed more when using it, now causing a big disadvantage when moving. The AWP has 10 bullets in a clip and is bolt action with shots taking about 1.5 seconds each. The AWP is available on both Terrorists and Counter Terrorists and in the professional scene is generally considered the hardest weapon to use, with dedicated players who train exclusively on using the power of the AWP. The AWP is one of the few weapons in the game that actually has a scope, with two settings you can zoom and magnify the lenses also. The AWP also has a high penetration also, with it being a one hit kill on chest up with the AWP, regardless of cover. The M4A1-S would have been in the number two position, however the weapon was recently nerfed by reducing the rate of fire of the weapon to become slower, more on par with the M4A4 now. The M4A1-s is a variant of the M4 carbine like the M4A4 however has a longer stock and a silencer which removes tracers in game. The weapon also only holds 20 bullets per clip, which makes it significantly weaker in spray battles, and only has 60 bullets to use overall per round. The FAMAS is CT’s number two weapon for when they cannot afford an M4A1, but still need to buy up. Produced in France the bullpup assault rifle is a strong rifle that has a good rate of fire alongside a manageable recoil pattern. The gun also features a burst fire and fully automatic option, which is just a gimmick however in the lower levels of Counter Strike play can be used. The weapon’s downfall is the fact that it holds 25 bullets, has a lengthy reload time of 3.3 seconds and also has a low accurate range. The weapon is also not a one hit kill at any range, and also has a lower damage than other assault rifles. In the right hands this weapon can change the tides of a force buy, however is nowhere near the same strength as the M4’s. The Desert Eagle is one of the most well known handguns in the world, providing semi-automatic fire witth the largest cartridge of any self-loading pistol. This makes the weapon deadly both in real life, and in CS:GO. Produced in the USA the Desert Eagle features a 7 round magazine in CS:GO alongside 45 spare bullets. In the professional CS:GO scene you will often see this weapon used in clutch plays. To “clutch” means to win the round as the last man standing for your team even if that means having to go against incredible odds like 1 vs 5. The gun has unparalleled accuracy, damage and penetration in comparison with weapons in its class. The weapon costs $700 dollars and still provides $300 per kill. No matter what range the weapon is a one hit kill to the head and is a two hit kill on any body part above the stomach up until long ranges. The weapon however has a low rate of fire, unpredictable recoil and does have high damage drop off at longer ranges. The Galil is the Terrorists version of the FAMAS. Produced in Israel the weapon has been manufactured since 1972 and provides a unique style of play in CS:GO with 35 bullets per magazine. The weapon is also very cheap, only costing $2,000 which is less than some SMG’s cost in the game. The weapon has a high rate of fire which compliments the magazine size, and has a rather good penetration power despite having rather low damage. The weapon does not one hit kill enemies with armor, but can one hit unarmored opponents to the head from close ranges which is where you should be looking to use the weapon from. The Galil has high recoil and can be difficult to control. The Heckler and Koch Universal Machine Pistol, or UMP for short is a German built weapon that has been in operation since 1998. The weapon is light weighing in at about 2.3 kilograms. In CS:GO the weapon only costs $1,200 and provides $600 per kill, meaning that to break even you will only need to earn two kills which can easily be accomplished. The weapon only holds 25 bullets per magazine, like the FAMAS. The weapon is a fatal hit to the head with no helmet, otherwise it will deal 90 damage which is still a significant value. The weapon is light weight, with low recoil and does very high damage in CS:GO often only taking 4 hits to kill. The problem with the weapon is it’s low rate of fire and long reload time, coupled with the small magazine can make it hard to use. The SIG Sauer P250 is a semi-automatic pistol featured in CS:GO. The weapon has been in service since 2007 and originated in Germany. The weapon features 12 bullets in CS:GO with the ability to one hit with a helmet on at close ranges. The weapon also only costs $300, and provides $300 as a kill reward meaning it only takes one kill to break even. The weapon however features only two reserve clips, and low accuracy after continued fire. However this is the classic eco round weapon and in the pro scene can turn the tides of a round with the one hit kill. The SSG 08 is an Austrian Made bolt action sniper rifle, which has 10 rounds per clip of 7.62 NATO ammunition. The weapon is cost efficient at $1,700 however is not a one hit kill unless it is to the head, with the exception of the stomach with unarmoured opponents. The weapon is lightweight, cheap and has good amounts of reserve ammo. The weapon can also can be used effectively whilst jumping if you shoot at the peak of the jump. The weapon however has a low rate of fire and inflicts low amounts of damage in comparison to the AWP. In the pro scene this weapon is rarely seen but can most certainly be used well. That is the top 10 weapons for CS:GO in my opinion, master these weapons and you can dominate your opponent and rise the ranks.